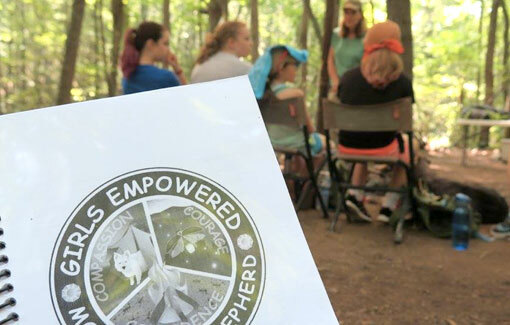 Mountain Shepherd Survival School serves as the “base camp” for G.E.M.S campers during their week-long experience, whether they sleep snuggled into the bunk rooms each night or spend several nights camped out on the trails. 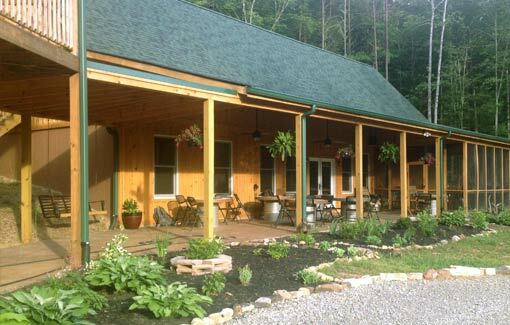 Mountain Shepherd is nestled in the Blue Ridge Mountains of Craig County, Virginia. The facility sits on a secluded 100 acres, bordering the Jefferson National Forest with the Appalachian Trail for a neighbor. The area is welcoming to girls with little to no outdoor experience, with well-marked trails and parachute shelters over the outdoor classroom spaces. Go-getters will still find challenges and excitement around every bend with small streams to rock-hop over and steep hills to climb. 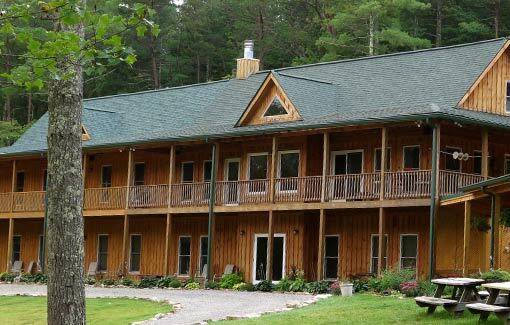 Inside of Mountain Shepherd’s modern-rustic lodge are a pair of spacious 10-bed bunk rooms perfect for hosting G.E.M.S. during their five-day stay. Girls arrive to find their names doodled on chalkboards posted around the room on the built-in bunk-beds. Provided linens and pillows make the room a little more homey from the start, though girls are encouraged to bring a few comforts from home, too. Campers have a shared bathroom within their bunk room, with mirrors, two sinks, two private shower and toilet stalls, and plenty of fluffy towels. During G.E.M.S. sessions, Mountain Shepherd’s “Pitchwood Pub” indoor dining area becomes a gallery of art projects, educational brainstorms, and personality posters. Everyday, campers and staff gather around the Pub’s custom tables to enjoy home-cooked meals for breakfast, lunch, and dinner. These tables also play host to card games, crafting projects, and trail mix buffets during camp sessions; if it weren’t for all of the great outdoor space, the Pub would surely become G.E.M.S. headquarters! Overlooking the pond is the stage, where G.E.M.S. 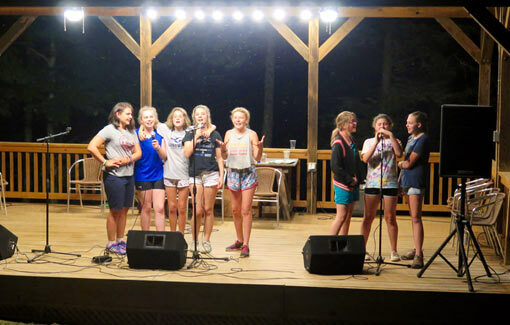 campers often practice for and perform talent shows, try out new yoga poses, and reflect on their busy days of empowerment and education. The stage also shelters campers and staff from sudden summer rain showers, providing cover so that the outdoor learning can continue! A large tent with comfy cots inside also appears on the stage every so often, giving girls who are nervous about sleeping outdoors an opportunity to challenge themselves in a more familiar way. Up the hill and across the stream is where G.E.M.S. trek to learn and dream! The outdoor classroom is tucked away along one of the many trails that wind across Mountain Shepherd’s property. Covered by a repurposed parachute and dotted with camp chairs circled around a fire pit, the outdoor classroom brings together the “frontcountry” and the backcountry to provide a breath of fresh air for learners. In this creative classroom, G.E.M.S. campers find themselves more connected to their natural surroundings while practicing survival skills and exploring the land. Even the drive to Mountain Shepherd Survival School is beautiful! You’ll meander through a picturesque valley dotted with farms and crisscrossed with streams. You may even pass by an Appalachian Trail thru hiker and you are sure to see deer! The lodge and all its amenities are available throughout all the courses. The experience is yours – you can choose to use the modern facilities or fully immerse in nature. Looking for a venue for a private event, a corporate retreat, wedding, reunion, birthday party or bachelor party? Please contact Dina at dina@mountainshepherd.com for more information. Please keep a copy of the directions with you when you travel. Technology does not serve our area well and often sends drivers the long way, the wrong way, or to a completely different location. If your schedule allows, travel during daylight hours. The views are spectacular! Interstate 81 South towards Roanoke, Va. Take Exit 141. Take a left at the stop light. The next light is Route 311. You’ll see the Orange Market on the left. A BP and Subway on the right. Take a right. Follow Route 311 for 12 miles to a left on Route 621/Upper Craigs Creek Road. Follow Route 621 for 9.3 miles. Set your odometer, as it is a long and winding 9.3 miles to our sign on the right. Our property is lined with a brown wooden fence. Take the right on Hemlock Ridge Lane and stay straight through the red gates. Get a bit of momentum heading up the hill. Parking area is at the bottom of the circle driveway. property is lined with a brown wooden fence. Take the left on Hemlock Ridge Lane and stay straight through the red gates. Get a bit of momentum heading up the hill. Parking area is at the bottom of the circle driveway. Take 460 East to a left on Route 621. (If your GPS directs you to turn on Route 42, avoid it. You will end up on dirt road. Stay on 460 until you reach Route 621!) Watch for a brown Jeerson National Forest sign and a sign for Pandapas Pond on the right. The left turn on Route 621 is just past that sign. Follow Rt. 621 for 11.9 miles to our sign on the left. Just before the turn on Hemlock Ridge Lane you will pass a white church on the left and a subdivision, Foxre, on the right. Our sign is tilted a bit in the other direction. Our property is lined with a brown wooden fence. Take the left on Hemlock Ridge Lane and stay straight through the red gates. Get a bit of momentum heading up the hill. Parking area is at the bottom of the circle driveway.